Healthy, balanced breakfast are great, but you know what? Sometimes you just need a little a.m. indulgence. 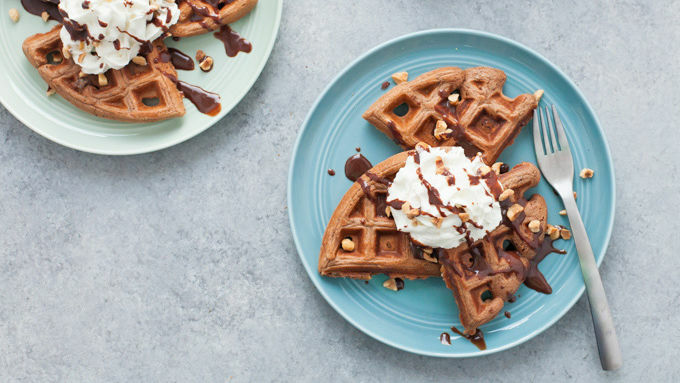 You can have a kale smoothie tomorrow morning, because today, you’re having these chocolaty and rich Nutella™ Crunch Waffles. These waffles are a breeze to put together—they only use one bowl, and it’s less than a half hour start to finish. To make them more indulgent, top them with a drizzle of more Nutella™, whipped cream and some warmed maple syrup (treat yo’ self!). Want to go a little healthier? They’re great topped with nut butter, fruit and chia seeds, too. For a fun and different party idea, try making these babies for a waffle party! Set up a topping bar with all the toppings someone could want (whipped cream, flavored syrups, nuts, fruits, etc. ), add lots of coffee (or mimosas!) and invite your loved ones over for a super fun brunch. 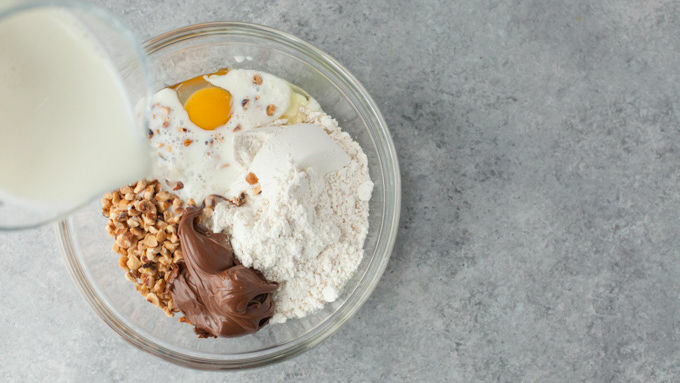 If you’re feeling really into the concept, whip up a few different types of waffle batter (there are a ton of great waffle recipes on Tablespoon), and let folks make their own perfect combo. I’d pick these Nutella™ Crunch Waffles every time! Thin out some Nutella™ Hazelnut Spread with a little bit of milk to make it perfectly drizzle-able on top of your waffle stack. For a more intense chocolate flavor, double the cocoa powder. 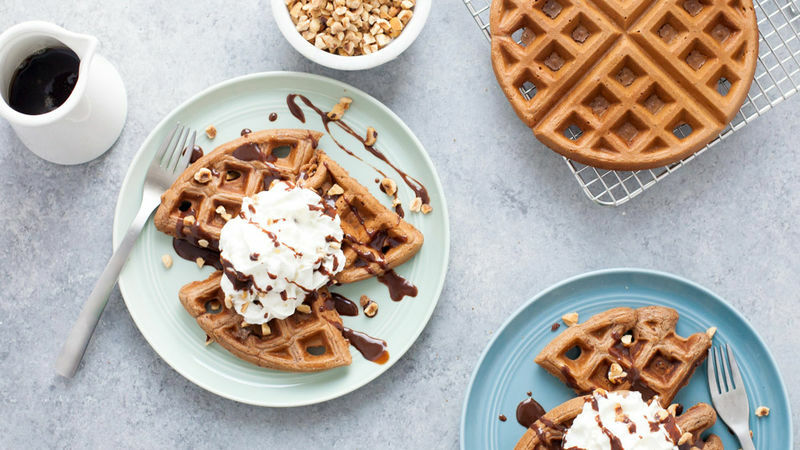 Waffles are the perfect freezer food. Double or triple the recipe, and freeze the extras for even quicker breakfasts later on. Just cool the waffles completely, then freeze flat on a baking sheet. Once frozen, transfer to a zip-top freezer bag. To reheat, just pop in the toaster. Healthy, balanced breakfast are great, but you know what? Sometimes you just need a little a.m. indulgence. 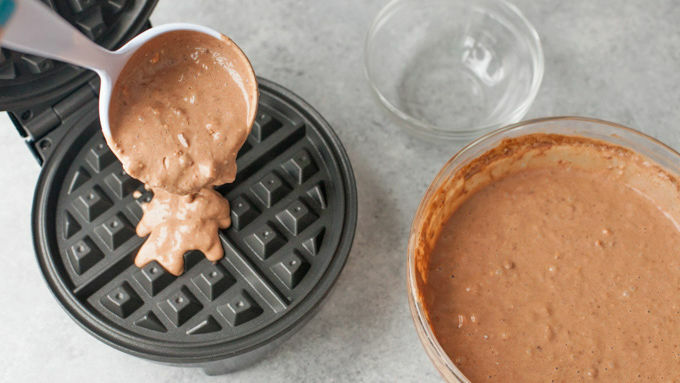 You can have a kale smoothie tomorrow morning, because today, you’re having these chocolaty and rich Nutella™ Crunch Waffles. These waffles are a breeze to put together—they only use one bowl, and it’s less than a half hour start to finish. To make them more indulgent, top them with a drizzle of more Nutella™, whipped cream and some warmed maple syrup (treat yo’ self!). Want to go a little healthier? They’re great topped with nut butter, fruit and chia seeds, too. 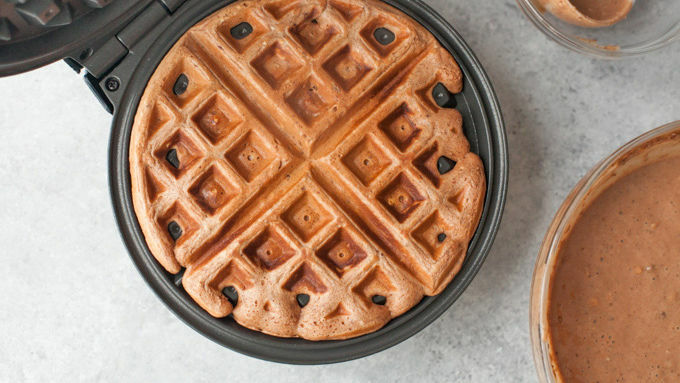 For a fun and different party idea, try making these babies for a waffle party! Set up a topping bar with all the toppings someone could want (whipped cream, flavored syrups, nuts, fruits, etc. ), add lots of coffee (or mimosas!) and invite your loved ones over for a super fun brunch. If you’re feeling really into the concept, whip up a few different types of waffle batter (there are a ton of great waffle recipes on Tablespoon), and let folks make their own perfect combo. I’d pick these Nutella™ Crunch Waffles every time!